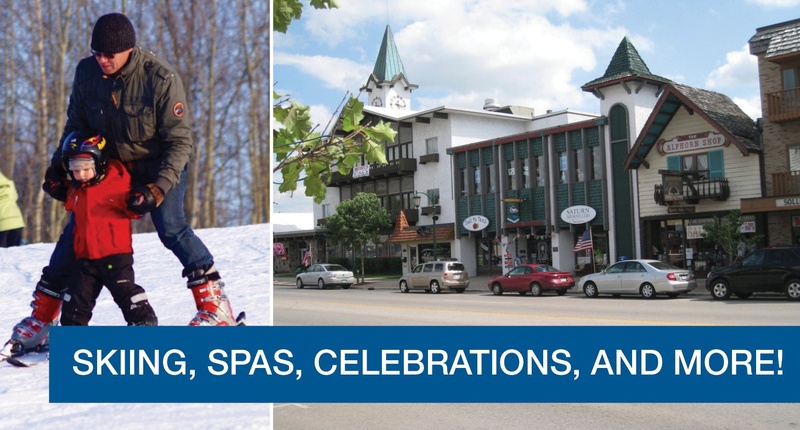 The Treetops Resort Ski Free Weekend begins at 10 a.m. on Friday and continues through close on Sunday. Take advantage of this amazing offer and enjoy the fresh air and fast runs. If there are people in your group who don’t know how to ski, this is the perfect opportunity to learn; Treetops is holding a Learn-to-Ski Clinic on Saturday. Seasoned veterans of the slopes can bring their own ski equipment and novices can rent everything they need. If your equipment needs a tune up, the Ski Shop can handle everything from sharpening and waxing to base repair and testing your bindings. Each overnight resort guest will receive a free lift ticket, valid for one day of skiing. A new weekly tradition starting at Treetops is the Heikki Lunta Party, debuting Dec. 14 at 7:30 p.m. Based on a myth from the Upper Peninsula Fins, who settled and mined there, it’s meant to appeal to the Heikki Lunta, the Finnish snow god of snowfall. It’s all fun and games (and entertainment) around a bonfire at the top of the hill — no reservation required. You’ll want to prepare by learning The Heikki Lunta Snow Dance Song so you can join in. For the extra adventurous, Treetops Resort also offers Extreme Tubing by the hour for kids and adults, snowshoeing, ice skating (free for resort guests), fat tire biking (rent by the hour, day or week), and cross country skiing trails for those who prefer the vertical plane to the horizontal. If you have non-skiers in your group, don’t despair; Treetops Resort and Gaylord have plenty more to satisfy even the most discerning. For example, the Treetops Spa has everything a body could need to become revived, refreshed and rejuvenated. Mani-pedi — check! Nine types of massages — check! Facials and treatments —check! Full-service salon, from men’s cuts to women’s updos — check! Treetops Spa also offers a range of packages for BFFs, couples and everyone else who just wants to relax. You’re sure to be ravenous after taking part in so many activities, so take time to explore all the dining options. Try breakfast and dinner at Hunter’s Grill where from Oct. 18-Dec. 23, those 50 or older receive half off their dinner entrée and those 30 or older get 30 percent off. For lunch or dinner there’s The Sports Bar with happy hour from 3-6 p.m., hand-tossed pizza and a bevy of beer choices. Then try breakfast at Legends of the Hill, a buffet touted as the “Breakfast of Champions” every day from 6-11 a.m.
As long as you’re up north, you will want to spend at least a little time shopping and enjoying the Alpine-Village-themed city of Gaylord. For an eclectic mix of souvenir shops, all kinds of specialty food stops, jewelry stores, home décor shops and more, try the walkable downtown area. If you prefer major retailers, the west side of town may be more suitable. Or try them both! Another not-to-be-missed family fun stop is the Call of the Wild Museum where displays of animals of the north seem real enough to pounce. You’ll see the wildest of the wild, including polar bears, lynx, cougars, bears and wolves; Call of the Wild has them all. There’s also an extensive gift shop (think Christmas gifts), a Wildlife Theater and a Discovery Room, so there’s something for everyone to enjoy. A great place to end your day in town is on the Craft Beer & Tap Trail where the “foam roam” will take you to some of the area’s newest and most celebrated craft and microbrewery hotspots. Download the map and list and plan to hit the trail. No matter the athletic level of your group members, all they need is a little sense of adventure to have a fabulous time. And if you need help booking your bus or planning your trip, just download our “Complete Guide to Booking a Bus,” and get ready for a great trip north.